Stained glass is another hobby of mine. I took some really amazing classes at The Vinery in Madison, WI. 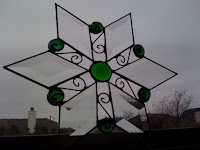 I haven't yet found a good glassworks establishment in Austin, TX yet so if you know of one, please pass it on. Here are the pieces I've completed to date. 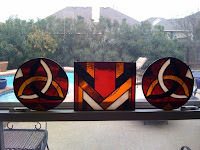 The three red, amber and brown pieces with a Frank Lloyd Wright art style are the first pieces I made. I then took a snowflake class and made a half dozen of those. Some have already been given as gifts, but here are the ones I still have. The dragonfly is the last one I did while taking an advanced workshop with a friend of mine. The body of the dragonfly is actually a full 3D pewter dragonfly body that is tacked on top of the glass with solder. 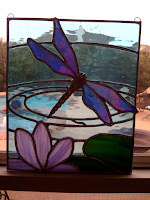 The original designed called for cutting out a dragonfly body from foil but I thought that would really look cheap, so when I happened upon the dragonfly body at The Vinery one day, it fit perfectly and I was overjoyed with how it turned out. I think it really makes the piece. Sorry you can't see it better, but I don't have a good digital camera yet and take these pics with my iPhone for now. I don't have a lot of window space in the Texas home to hang these due to all the blinds to keep out the sun during those hot summer days which is unfortunate. 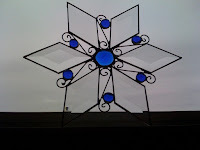 I'm not sure if I'll do any more stained glass in the near future unless I find a place to take more classes which always inspires me to do more and extend my abilites. Hope you like them.